Gaby & Dan are Fun In The Sun Weddings newest newlyweds! 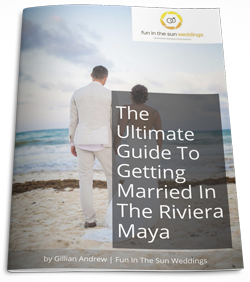 This bride and groom brought family together for their wedding in the Riviera Maya in search of a big, bold fiesta. And their beach wedding didn’t disappoint…even with major hiccups from the veil. Gaby is from El Salvador, and she spent six years during their relationship begging him to join her on their family vacations to the country. When he finally did, he fell in love with the country, the food and her family. And so, before the trip ended, in her favorite place on the beach at sunset, he proposed to her. Deciding on where to get married was a little tricky in the beginning. It was between El Salvador, Canada and Ireland. And then they saw photos on Facebook of Dan’s co-worker’s wedding in Mexico, and that was it. A beach wedding at the Grand Sirenis Riviera Maya was perfect for them. The bride wove the essence of Mexico throughout their wedding. Their wedding theme was big and bold, with bright colors and a mantra of “Fiesta, siesta, tequila, repeat”. 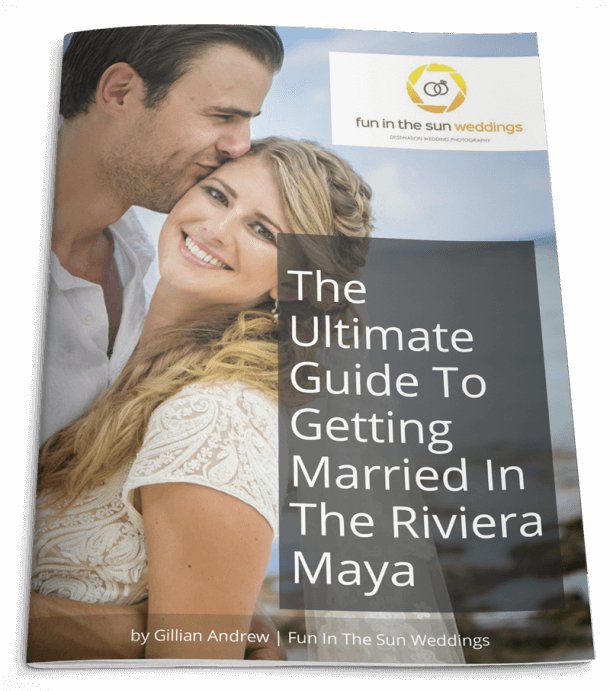 From the pinata & mariachi, to the multiple DIY projects like custom shot glasses for the wedding favors, and the guests’ welcome bags stuffed with custom tumblers and homemade cookies in the shape of pinatas and maracas, Gaby and Dan made their Riviera Maya wedding an extra special celebration for their guests. Hiccups are a part of every wedding, and at this wedding, the culprit was the veil. First, Gaby left it behind, locked in her room alongside her room key. And then during the wedding ceremony, the veil flew off in the wind! Apparently, this veil did NOT want to participate in the wedding. But Gaby took it all in stride, and as her bridesmaid pinned the veil back into her hair, Gaby hummed the Jeopardy tune to the amusement of her guests. Relax and take it all in. At one point during the day my mom nudged me and told me to look around it was a great piece of advice. Gaby and Dan, it has been wonderful sharing in this amazing adventure with you. We wish you nothing but happiness in this next chapter of your lives together. And if you are looking for the best wedding photographers in Akumal for your beach wedding, then contact us today! We are Fun In The Sun Weddings, the best photographers in Riviera Maya, Mexico. Want to know more about Grand Sirenis resort? Read unbiased reviews on Tripadvisor here. Marc, just wanted to tell you that the photos are AMAZING! Honestly, we are so happy with them, I can’t even put it to words. Thanks so much for everything.